The Fed's March 19-20 two day meeting will be to most FOMC member a crash course in humility. Back in December, when Powell infamously stated that the Fed's balance sheet unwind is on "autopilot", a statement the Fed Chair promptly came to regret just a few days later when the S&P briefly tripped into a bear market before staging a historic rebound after Powell reversed dovishly on every possibly occasion, the Fed indicated in its Summary of Economic Projections that the US economy is growing at a solid pace, with GDP expected to reach 2.3% in 2019 as the unemployment rate tumbled to 3.5% even as 2019 Core inflation remained subdued at just 2.0%, a drop from the 2.1% projected at the prior, September, SEP forecast. But more importantly, the Fed also revealed that it expects at least 2 more rate hikes in 2019 (down from 3 in September), which would see the Fed Funds rise to 3.1% in Dec. 2019, and another rate hike in 2020 bringing the US rate to 3.1% at which point it would peak before drifting lower to its longer-run rate of 2.8%. Needless to say, within the SEP - which a recent study found had been more often wrong than right - it is the Fed's dot plot that is under the microscope. As Bank of America says, "the dots are loved by some but are hated by many." As the latest FOMC minutes showed, there are even some Fed officials on the Committee who would like to see an overhaul of the exercise, noting that they were "concerned that, although the individual participants' projections for the federal funds rate in the SEP reflect their individual views of the appropriate path for the policy rate conditional on the evolution of the economic outlook, at times the public had misinterpreted the median or central tendency of those projections as representing the consensus view of the Committee or as suggesting that policy was on a preset course." In a February Bloomberg op-ed, Mohamed El-Erian made the case to eliminate the dots, when Bill Gross' former partner suggested the Fed could consider following the template of the Bank of England's "Inflation Report," which releases a complete staff assessment of monetary policy conditions with fan charts rather than point estimates. 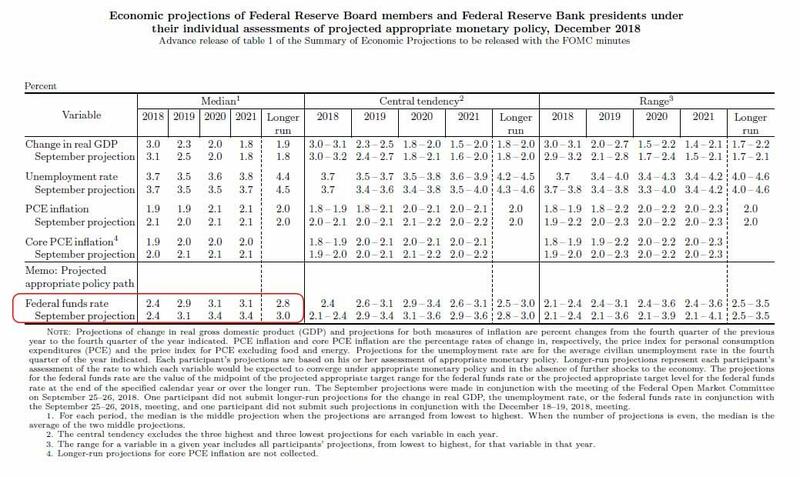 This gives more detail about the Fed's reaction function and takes out the perceived precision of the dots. In retrospect, following the huge hit to the Fed's credibility that Powell's 180 degree reversal in the past three months created, it would certainly be convenient to make the dots more conditional and scenario-based at this point in the cycle. As Mester noted, the Fed has returned to "normal" monetary policymaking, which means the outlook will be more conditional on the outlook and less programmatic. However, as BofA warns, removing the dots at this point would be helpful in the near term, but hurtful in the long run. When the time comes to cut rates again, the Fed is likely to return the ZLB quickly. The dots will then become a critical tool for the Fed who will otherwise have limited ammunition. It is possible the Fed could stash the dots away during good times and reintroduce them in downturns, but that only adds to the Fed's credibility challenges. Moreover, such a move would need consensus within the FOMC and many still see benefits in releasing the dots. Whatever the ultimate fate of the "dots", they will be with us for a while, and they will present a major challenge at the upcoming 19-20 March FOMC meeting for one reason: Fed officials have been communicating that they will be on hold for some time and are largely unwilling to send a signal about the timing of the next hike. This makes the dots - as they currently stand, predicting 3 more rate hikes by the end of 2020 - quite problematic, especially if as JPMorgan recently suggested, the Fed may go so far as to eliminate all hints of rate hikes in 2019. Which brins us to the topic of this post: the humiliation of the "smartest people in the room" they had no idea what was going on as recently as 3 months ago. Worse, the "smartest people in the room" will now have to drastically revise their projections lower to justify the drop in the dots, without spooking the market that i) a rate cut is imminent and ii) the US economy is far weaker than most expected. Looking at the distribution of the dots, only three FOMC officials would need to shift from two hikes this year to one hike to move the median to one hike for 2019. That's the easy part; the difficult part is that no less than seven officials would need to move to get the median to zero for this year which - as BofA concedes - is a "much harder case to make", especially without sparking fresh recession fears. According to BofA's "dot exercise" the "core" members of the FOMC were likely forecasting two hikes for this year in December (Bowman, Brainard, Clarida, Powell, and Williams). Based on speeches since then, it appears these Fed officials are all at risk of revising down their outlook for the path of policy. Other Fed officials we pegged at three hikes in 2019 (eg, Evans) could also make the move down to one hike. As to how the Fed's adjust to telegraph no rate hikes at all in 2019 by dragging the median dot not one but two notches lower, all bets are off how the various FOMC members will do that without the Fed suffering dramatic "reputational" damage. In summary, while it is important to pay attention to the wide range of voices on the FOMC, in Bank of America's view the most important remains the trifecta of Powell, Clarida and Williams. Recent comments from Williams and Clarida suggest they both may be in the no hike camp. Recently, vice chair Clarida noted on Wednesday that the Committee is very close to their employment and inflation goals and there are scenarios where they might not hike this year. Also, Williams suggested that the current inflation outlook is not sufficient to raise rates again this year. So once again the dots will be confusing. : while the median will likely still show hikes in the outlook (absent a shocking capitulation by most on the FOMC), the core of the committee, which holds the trifecta, will likely shift lower, perhaps removing all hikes for the year. And just to make sure the humiliation is complete, keep in mind that the market now expects 1 rate cut in 2020 (whether that happens is a different matter as discussed earlier), so there is the distinct chance that the Fed's capitulation may be even worse if, in order to give the market comfort, Powell & Co. somehow manage to hint at a rate cut in the coming year. How will the market react, and whether all this dovishness (and more) has already been priced in, will be revealed at 2pm on Wednesday.